DETROIT – The all-new, GM-developed Hydra-Matic 8L90 paddle-shift eight-speed automatic transmission offered in the 2015 Corvette Stingray and Z06 enhances performance and efficiency, while delivering exceptional refinement and world-class shift responsiveness that rivals the world’s best dual-clutch transmissions. In fact, in the 2015 Corvette Stingray, it enables a class-leading 29-mpg EPA highway estimate – a 3.5-percent increase in fuel economy over the previous six-speed automatic – and a quicker 0-60 time of 3.7 seconds, all while delivering wide-open-throttle upshifts quicker than those of the dual-clutch transmission offered in the Porsche 911. With four simple gearsets for optimal efficiency and five clutches (two brake clutches and three rotating clutches), creative packaging enables the new eight-speed automatic to fit the same space as the previous six-speed automatic – and the powerflow only uses two open clutches for low spin losses, which enhances efficiency. Extensive use of aluminum and magnesium also make it more than eight pounds (4 kg) lighter than the six-speed. The greater overall performance and efficiency enabled by the 8L90 in the Corvette is due primarily to a new, wider 7.0 overall gear ratio spread, which enhances off-the-line performance with a more aggressive first gear ratio – 4.56 vs. 4.03 on the six-speed – helping achieve the quicker 0-60 time. The top gear ratio is 0.65 vs. the six-speed’s 0.67. Combined with a new, numerically lower 2.41 rear axle ratio in the Stingray vs. the 2.56 gear used with previous six-speed automatic models, engine rpm is reduced by 8 percent (123 rpm) on the highway at 70 mph. The lower engine speed reduces fuel consumption, while a new torque converter design enhances refinement, particularly during low-speed gear changes. Stingray models equipped with the Z51 Performance Package feature a more aggressive 2.73 axle ratio, while the Corvette Z06 features the 2.41 axle ratio. 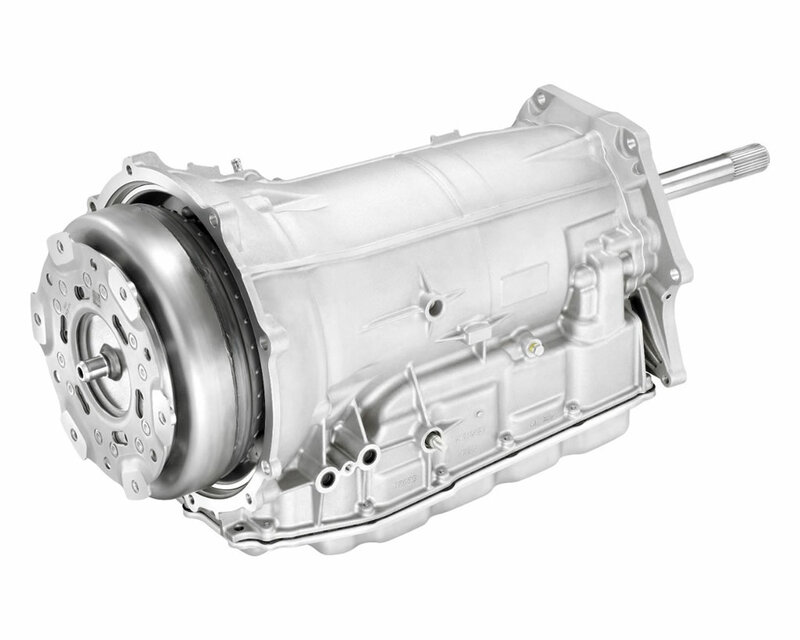 Designed and built by GM, the paddle-shift 8L90 transmission delivers world-class shift times that rival the best dual-clutch designs. For performance driving, the transmission offers full manual control via steering wheel paddles. A new transmission-controls system and unique algorithms deliver shift performance that rivals the dual-clutch/semi-automatic transmissions found in many supercars – but with the smoothness and refinement that comes with a conventional automatic fitted with a torque converter. In fact, a new, Gen II transmission controller analyzes and executes commands 160 times per second, and wide-open throttle upshifts are executed up to eight-hundredths of a second quicker than those of the dual-clutch transmission offered in the Porsche 911. Smaller steps between gears, compared to the previous six-speed automatic (see chart above), keep the engine within the sweet spot of the rpm band, making the most of its horsepower and torque to optimize performance and efficiency. Additionally, a torque converter design with a turbine damper complements performance with excellent refinement at low engine speeds. Unique clutch and torque converter specifications matched to the torque capacity of the Stingray’s LT1 6.2L naturally aspirated engine and the Z06’s LT4 supercharged engine distinguish the applications for the different Corvette models. More than 550 computer-aided engineering analysis were made during the development of the 8L90 to ensure strength, durability, performance and refinement. The architecture features a one-piece case with an integral bell housing for enhanced powertrain stiffness, as well as a detachable extension for the Corvette’s rear transaxle arrangement. Similar to GM’s six-speed automatic design, the eight-speed’s architecture locates the grounding clutches rearward of the middle of the structure, outside the gearsets. However, the grounding clutches are splined to the case, eliminating the center support, which reduces weight. This architecture also features a turbine shaft node that reaches to the outside of the barrel, enabling easy execution of a high-resolution magnetic speed sensor. The turbine shaft itself is very short, keeping oil channel drill lengths to a minimum. The rotating clutches are located near the front of the transmission, with short oil feed channels, supporting the transmission’s very fast shifts. Clutch compensators are fed by lubrication oil rather than the dedicated and regulated feed design of the 6L80. There are two benefits of this new design feature: The reduction of one oil channel between the valve body and the rotating clutches, which reduces the number of rotating oil seals and oil channels within the turbine shaft; and, secondly, the capability for rapid discharge of oil in the compensators during clutch apply, for greater control. An industry-first off-axis, chain-driven binary vane-type pump – located within the valve body – effectively allows for two pumps in the packaging size of a single, which contributes to lower parasitic losses and optimal priming capability, as well as ideal oil routing to the controls system. The binary pump enables a 60-percent reduction in pump torque at points that represent large portions of the operating duty cycle, compared to the 6L80 six-speed, which is a significant contributor to the overall efficiency gains offered by the 8L90. The binary pump is located very low in the sump, for greater cold prime operation – as low as -40 F (-40 C) and excellent high-speed operation with stable line pressure. Thanks to a new torque converter clutch friction lining and a new control strategy, the 8L90’s squashed torque converter uses conventional dual-path converter feeds. New synthetic fluid with improved cold temperature performance and reduced friction characteristics. Shift time quickness and improved responsiveness are accomplished with the new Gen II controls system. VFS solenoid technology and three internal speed sensors give the 8L90 the capability for world-class shift performance. The new transmission controller is mounted external to the transmission and has a processor that executes hundreds of calculations and commands every 6.25 milliseconds.